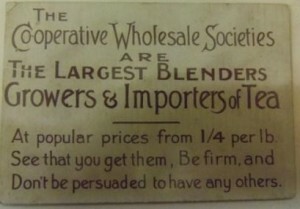 A calling card to promote tea in 1930. Henrietta’s memoir commences with memories concerning her mother’s work as a child and she highlights the difficulties of obtaining food, finding childcare and the pittance of wages. Her mother worked for the Wholesale Co-operative Society in the tea packing department where her wages ‘were given up to keep the house going’ (1.3). However after Henrietta’s biological father died of Typhoid, home conditions were very difficult and her mother had to cope as a single parent. She was left with no widow’s pension and was forced to work at the local workhouse (1.4). She earnt fifteen shillings a week and had little spare cash due to rent and childcare for Henrietta whilst maintaining good health and a frequent supply of food. These inadequate conditions are highlighted when a middle-aged couple persistently offered to adopt Henrietta, despite her mother refusing to give up her child (1.4). The importance of work for Henrietta’s mother dominates their relationship as without this work they would have no source of income. The difficulties are emphasised when their landlord took care of Henrietta when she had measles otherwise her mother ‘would have had to stay at home without pay’ (1.6). Although there is no specific reference to class identity in Henrietta’s memoir, she implies that life was difficult and work was essential in order to survive, thus demonstrating they were part of the working class community. There is a dynamic shift in Henrietta Burkin’s memoir when her mother meets Henrietta’s step-father. Henrietta states that is was ‘a great change into our lives’ (1.7) and her childhood became increasingly comfortable with her step-father’s presence. The unnamed bachelor was a Mains Foreman for the Electricity Company at Charing Cross who had, ‘a steady wage of one pound a week’ (1.7) thus enabling them to rent an entire house. Frequently throughout the memoir, Henrietta shares the rises in wages he received with her audience and highlights specific characteristics of her home. She states that there was, ‘an underground kitchen and scullery’, ‘rooms were lit by gas’, ‘an open dresser in the kitchen’ (1.8) and describes the hearth in precise detail displaying the upgrade compared to her previous accommodation. Her step-father liberated Henrietta and her mother and allowed them to develop a close bond. Henrietta’s mother left her job in the workhouse and was able to focus on caring for Henrietta by providing a comforting home life for her family. Henrietta’s step-father received continuous promotions after resettling in Charing Cross and they became popular in the neighbourhood. She acknowledges that ‘money was a little more plentiful’ (1.11) and she was ‘amazed how many people knew Dad’ (2.5). I suggest that his increase in wage and position at work led to an ease of mixing with others higher in the social hierarchy than themselves. 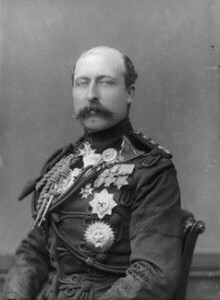 A humorous encounter in the memoir is Henrietta’s step-father’s accidental meeting with the Duke of Connaught. He is described as ‘a “posh” gentleman’ (2.9) clearly distinguishing the social class between the two individuals. Henrietta’s step-father was oblivious to this gentleman and I think it highlights that he does not aspire to be part of a higher class and instead is content with his family, job and current social status. His labour throughout the chapters are portrayed as a source of pride and the harmony amongst colleagues is demonstrated through the close knit relationships and Henrietta acknowledges that, ‘they would do anything for him’ (2.9). Subsequent to leaving school, Henrietta contributes to the family income. In her first job as a secretary, she worked 9.30am to 5pm and till 12 noon on Saturdays. She successfully worked for eleven years and earnt a substantial wage of thirty shillings a week (2.8). Collectively with her own income and her step-father’s steady wage of £40 a week, the Burkin family were comfortable and she states that they ‘were really in the money’ (2.10). This allowed them to enjoy a fortnight’s holiday each year, visiting the Isle of Wight, the Lake District and ‘even four days in Holland’ (2.10). The labour in Henrietta’s family allowed for simple pleasures and yearly holidays. Their class identity is presented through the manual labour of her step-father and by spending their income wisely on necessities. Despite the hardships during Henrietta’s earlier childhood, I admire the relationships held between the family members to cooperate together and provide for each other, thus leading to a more pleasant life. Brooke, Stephen. ‘Gender and Working Class Identity in Britain During 1950s’. Journal of Social History 34.4. George Mason University Press: Fairfax. (2004): 773-795.